Jay Leno Makes "Marriage Ref" Guest Appearance, Talks Being Back at "Tonight Show"
Jay Leno stepped out on the red carpet on Sunday night with wife Mavis, hitting the Vanity Fair Oscar party in Los Angeles. 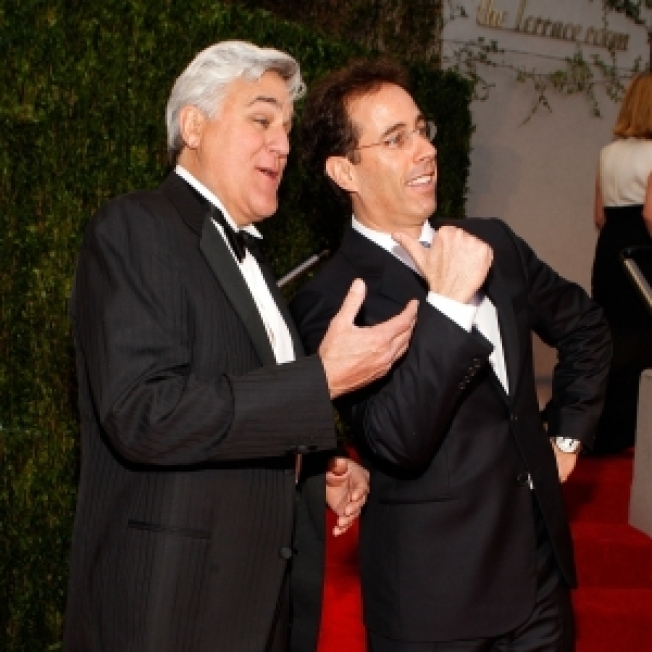 He also hammed it up for the photographers on his way in, posing with NBC pal and fellow comedian, Jerry Seinfeld. And, Jay revealed to Access Hollywood's Tony Potts that he recently helped out with Jerry's "The Marriage Ref." "I did a guest spot on it," Jay told Tony, referring to the new NBC primetime show that features celebrity panelists who weigh in on a conflict between spouses. "It's a fun show," Jay commented. "I liked doing it." As for his own program, "The Tonight Show," which Jay returned to last week, Jay said he is happy to be back. "Yeah, it's good. I'm good," the late night host told Tony. "We're happy… So just keep my head down and [we're] doing what we do." "Is it renewed energy?" Tony asked. "I think so," Jay said. "We learn… you know, [from] some mistakes, and we know what to correct. You just try to keep the energy up and keep it going and there's a big cross section of America out there you have to appeal to, you can't just [target] one demographic group and that's the whole trick." "The fly-over states, as it were," Tony chimed in. "Yeah, exactly… and I fly over them every week. I perform in those states all the time," Jay said, referring to his comedy tour stops.